In what may turn out to be an escalation in Asia's African Swine Fever crisis - which began more than six months ago with its arrival in China - we learn today that a pork product carried into Taiwan by a traveler from Vietnam has tested positive for the virus. While not completely unexpected (see FAO: African swine fever (ASF) threatens to spread from China to other Asian countries) - should these products be confirmed to come from Vietnamese pigs - this would raise the stakes considerably. While Vietnam's Ministry of Agriculture (MARD) has yet to report an outbreak, they share an extremely porous border with China, and a search of the Vietnamese press for African Swine Fever (dịch tả lợn Châu Phi) returns an almost daily barrage of stories and warnings about the disease. First a brief except from an English language Taiwanese media report on today's announcement. TAIPEI (Taiwan News) – Taiwan’s Council of Agriculture (COA) has announced that it will hold a press conference, Feb. 15, to announce that the African Swine Fever (ASF) virus has been detected in pork products from the nations of Vietnam. The troubling announcement is a very likely indicator that the ASF epidemic in China has crossed the southern border into Vietnam, which will force Taiwan to increase scrutiny of travelers from the Southeast Asian country. For more details we turn to excerpts from a translated announcement from Taiwan's BAPHIQ (Bureau of Animal Plant Health Inspection & Quarantine) - which not only describes the recent interception of the ASF contaminated product from Vietnam - but adds to the growing list of contaminated pork products confiscated from travelers from China (see previous blog Taiwan Intercepts More ASF Contaminated Food Products). African swine fever Central Disaster Response Center today (15), said that to guard against the invasion of African swine fever, the Council of Agriculture Prevention and Quarantine Bureau from 107 in August starting from the airport, port passenger not into the airport (port) disposal of tank farm of Chinese mainland pork products sampling, detection of African swine fever virus sent to the Council of Agriculture animal health Research Institute (livestock Wei), prevention and Quarantine Bureau and from between 107 in November from increased pork products from Vietnam samples for examination. Council of Agriculture confirmed today for the first time since the Vietnam passenger carrying illegal pork sandwich detected positive African swine fever virus gene, Prevention and Quarantine Bureau has today officially inform the competent authorities in Vietnam. Another two pork products from mainland China also today confirmed detection of African swine fever virus gene, mainland China meat has reached a total 22 cases, the epidemic is still grim display in mainland China. Response Center added that, in addition to the case of Vietnam, today and another two pork products from mainland China also confirmed detection of African swine fever virus gene, mainland China has reached a total of 22 cases, show mainland China has not slowed down the epidemic; the first of which 21 Example Taichung airport passenger January 30th of entry Hong Kong flight, abandons box sampled pork dry (Jiangsu Province, three squirrels), 22 cases are born in mainland China visitors February 5 from Macao immigration Taichung Airport violations carry pork dry (to Iraq were, origin unknown) was seized and fined 200,000 yuan cut, due to non-payment of fines has been refused entry. 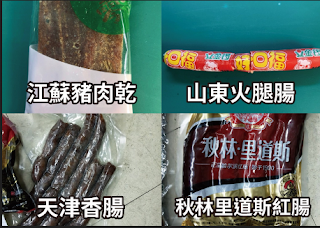 Finally Response Center to remind people traveling abroad do not carry immigration animal and plant products, especially meat, and do not net purchase of foreign meat sent to Taiwan, and offenders will be subject to heavy penalties, do not defy the law. While the ASF virus doesn't infect humans, the ramifications of its continued global spread could certainly impact the public's health and well-being. The most immediate involves the mass culling of pigs, which can deprive local populations of both the economic benefits and food protein of pork production. A particularly harsh blow for low-income, food-insecure regions of the world. But as ASF (and Classical Swine Fever (CSF), Foot & Mouth Disease (FMD), & Avian Flu) spread, they also inhibit international trade, and can help compartmentalize counties and economies. In recent months we've seen the spread not only of ASF in Asia and in Europe, but of CSF in Japan, and over the past couple of days, reports from Australia that FMD contaminated products have been intercepted at their airports. Meanwhile, the near silence from China's MOA on new outbreaks over the past 3 weeks has been almost deafening, with only one outbreak reported (Yongzhou City) since January 20th.